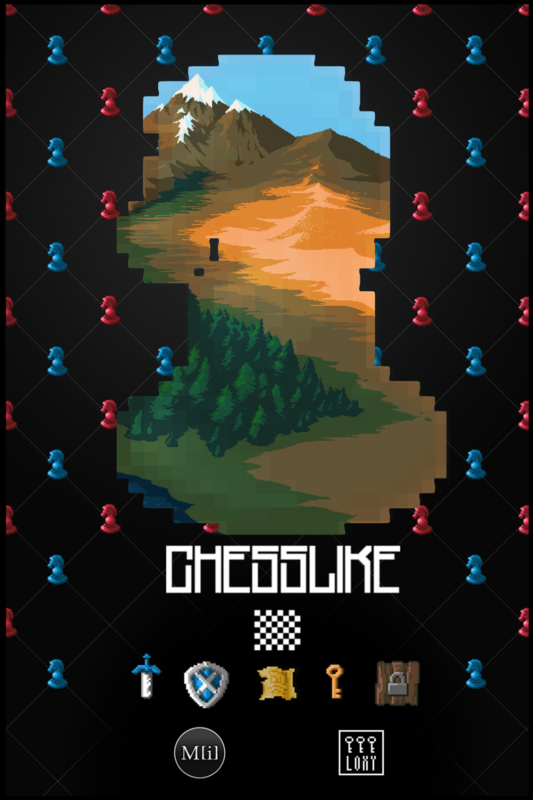 Chesslike is a chess-based dungeon crawler. There are a series of one-room levels interrupted by larger, multi-room castles. Each regular level has one of two goals: "Reach the Exit", or "Defeat all Enemies". In the castle levels the goal is to search the castle to find the King piece, Then capture it. Along the way the player will encounter swords and shields to upgrade their pieces, traverse levels with warp tiles and locked doors, and expand the party by summoning captured enemies. When a user registers for an account they gain access to the Level Editor. Using this tool anyone can create new puzzle levels for all to enjoy. The levels are immediately playable on chesslike.net. The game is fully playable online today. Eventually, with some more fine tuning, polish, and a boat load more content, I will export the game to the App Stores using some Web App to Mobile wrapper. I plan to release on iOS, Android, Windows Phone 8, and many more if interest is high. Registering will save your progress and allow use of the Level Editor. Chesslike: Adventures in Chess released on Android First! We've been playing around with both CocoonJS and Adobe's PhoneGap, but decided ultimately to go with CocoonJS. It seems to have worked just fine for releasing the APK to the store. There are some minor usability issues, but with CocoonJS, we are able to make some updates to the app without the user needing to download a new version of the app from Google. This will help us tremendously to smooth out some of the usability issues that have become more apparent with a larger audience. The plan is to get the usability working fairly well here on Android, and then push the latest build out to iOS this weekend, or early next week. At that point, we will make another large marketing/pr push to the outlets, and hopefully get another big hugs from the internet. Once that phase is complete, we will be moving into the rewards phase, where we are going to continue to make rapid iterations and updates to help polish and smooth out the game, while adding the unlockable new levels, castles and themes as we reach the download goals. 8000 Downloads = More Goals! We want to keep expanding this game, and keep growing the community, and this is how we will do it. If you like the game and want more content, tell your friends, get them to play it and download it. You can both use the online level editor to make new levels until we release new content as well. When all the goals have been reached, we will set new ones, with new exciting features, levels, and mechanics. Some of things we're thinking about for updates: King knights pawns(distributes swords), Capture the Princess Mode(capture the flag, new chess piece type), and maybe someday when we have about a million downloads, we want to build online multiplayer. I hope to see you there! PS - Russia loves our game! And we love Russia! We will be leading the translation efforts with the RU region. Cheers!